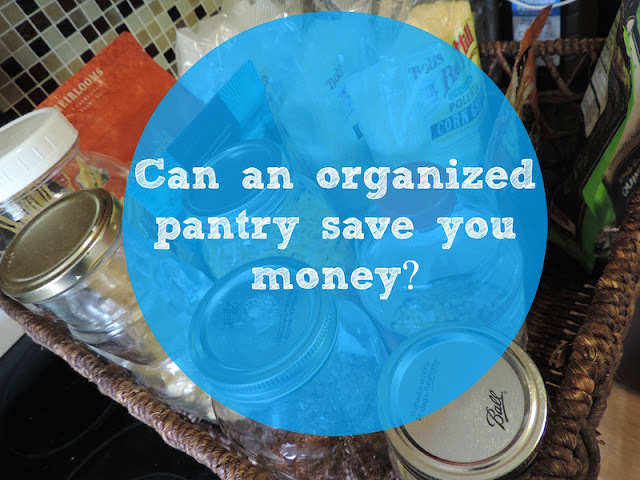 Blissful and Domestic - Creating a Beautiful Life on Less: Can an Organzied Pantry Really Save You Money? Can an Organzied Pantry Really Save You Money? I wasted $27 at the grocery store last week. It’s not that I bought I bunch of junk food or things we weren’t going to use. No. Instead I spent $27 on things we already had in our pantry. I did the math. If every week I accidently bought stuff we already had, that would end up costing my family $1,404 a year. Sure, we could eventually use those extra bags of rice or jars of peanut butter. But wouldn’t that money be better put into savings? Because my life lacked organization, because I wasn’t keeping good track of what was in my pantry, I ended up wasting money. A lack of organization has really been an underlying theme in my life. I am, after all, the woman who moved dirty laundry from one state to another in the trunk of my mother’s car in 2011. But can a lack of organization or inventory lead to wasting money? For sure. Think about it. An extra fee is tacked onto a bill that got misplaced and then you forget to pay it. A gas receipt didn’t get calculated because you threw it away instead of filing it with all your other receipts. A forgotten envelope of coupons can mean spending extra cash at the grocery store. So how do we combat these things? I wish I could say that I found a secret or trick to organizing my entire life from top to bottom. In fact, I laughed a little to myself when I typed that. Instead I picked one area and decided to diligently attack that. That one area was pantry organization. No, my pantry isn’t Pinterest worthy. I don’t have everything in matching clear containers with chalkboard labels. My cans aren’t all facing the same direction and not everything is clean and stark white. But I did take a simple pen and a simple piece of paper and write down EVERYTHING that was in my pantry. I even went as far as dividing it between sauces, grains, beans and canned goods. When it’s time to make my grocery list I do a quick scan of the list and then off I go to the supermarket. This has saved me both time and money. It’s so simple! Sometimes the concepts that save us the most money aren’t the most complicated ones. You didn't waste your money if you will use that food later on. That's called be stocked in case of an emergency. Prices will continue to go up, so extra bought at a lower price is like money in the bank in the future. Don't beat yourself up. I always buy at least 2 of everything - even when I have two. We could go months in the event of an emergency. In a domestic setting, people forget that waste can include excess inventory (too much stuff in the cupboard) but it is a waste as it severely impacts on cash flow, even if in real terms the food isn't quick to go off, it's money which isn't in your pocket. This is vital for people on very low budgets, in the UK there has been a huge growth in "pay day lending". This is a hugely immoral practice of people lending money at 1000% interest rates plus to people who can't make it to the end of the month. You can see how a debt spiral could start. Then there's also the risk of waste.